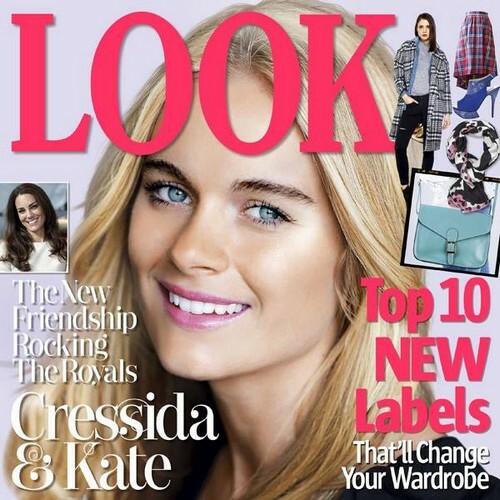 The latest cover of Look Magazine seems to imply that a budding friendship between Kate Middleton and Cressida Bonas is forming. On the surface, that makes sense – Kate is now a Duchess and is married to a Prince, and Cressida is also soon-to-be married to a Prince. However, those who know about the history between Cressida and Kate will know this friendship is extremely unlikely. Kate’s dislike and fear of Cressida has been well documented, and it’s due to a couple of different reasons. Cressida is younger, and Waity Kaity is jealous that she’s going to get the royal treatment so soon when Kate had to wait more than ten years for a proposal. But mostly, it’s because Cressida is half-sister with Isabella Calthorpe, and we all know Prince William‘s history with Isabella. Isabella was the one who split Will and Kate up in 2007/2008, where Will actually left Kate and dated Isabella for a while. Alas, it’s rumored that Will even proposed to Isabella at one point, but she clearly said no. So there was nothing Will could do but return to Kate, and in time, he ended up proposing to her. But Kate’s reportedly never gotten over the fact that Isabella almost stole her chance at landing Will. It’s not dissimilar to Prince Harry‘s situation with Chelsy Davy. The different is that Cressida’s actually interested in marrying Harry, even if her sister-in-law isn’t thrilled with the idea. Not only that, but don’t you find it odd that there’s been practically no photos of Cressida and Kate together, despite the fact that they’re often spending time with Harry and Will? It almost seems like one or both of them are going out of their way to avoid the other, and it doesn’t take a genius to figure out that all is not hunky dory in royal family land. Now, they may eventually have to put their differences aside, considering they’ll be spending much of their future together. But for now? It’s not looking like it.